Coffee and Cookies for Me, Please! To say there’s a time of year I don’t indulge in more than my fair share of coffee and cookies would be a lie. But when summer starts packing up her bags to give fall her time to shine, my coffee and cookies count goes through the roof! And that is because of the Big 3 – caramel, mocha and pumpkin. When that first fall breeze sweeps through, it seemingly carries caramel and company on its heels, with decadent dessert-quality coffees turning up at every café you come across. There’s also flavorful blends with one or more of those flavors infused to take home, of course, which means I don’t even have to leave the house to make my taste buds tap dance! But for as pleasing as pumpkin coffee may be – as mouthwatering as mocha and captivating as caramel – sipped on their own there is something missing. And that something isn’t anything they are lacking unto themselves, oh no! They are as perfect as they can be alone. But like so many things in life, their greatness is best realized with a best friend at their side. And that best friend is the one…the only…cookies. There are more than a couple cookies on my list of favorites, including my mom’s anise cookies, yummy Oreos, and the oh-so-good cookie trio tucked inside our tower cookie gift baskets. Yes, what looks like two pretty, innocent boxes is actually home to a dozen decadent delights. 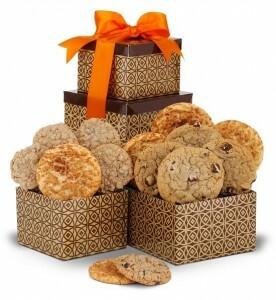 This cookie gift basket is filled with some of the freshest, most flavorful Snickerdoodle, Chocolate Chip and Oatmeal Raisin cookies your coffee has ever had the pleasure of meeting. And that makes them a perfect gift for yourself or the coffee lover in your life!